It’s been far too long since I’ve done one of these reviews, but it’s not for lack of subjects, believe me. While I’ve managed to keep my pen-purchasing under control for the most part I still have quite a back log waiting for their time in the sun. Those are going to have to wait, though, because a few weeks ago I bought a pen I’ve been lusting after for years. Sort of. I was browsing the new items at one of my favorite online pen stores Jet Pens, when I came across a photo of the Pilot M90. And before I knew what was happening my mouse was clicking “add to cart” and I’d just spent more on a pen than I ever had before. By a significant margin. I’m not going to tell you how much, but if you’re curious I’m sure you can find it online with little trouble. The Pilot M90 is the new, limited-edition anniversary release of a classic design, the Murex MYU 701. I have lusted after this pen since the first time I saw it, but with prices on ebay often topping out at $300 I was forced to admire it from afar. This new anniversary edition is nearly identical to the original as far as I can tell (never actually having handled one in person). Since I haven’t yet gotten around to scanning more meeting notes I’m posting this pen review a wee bit prematurely (because I haven’t gotten around to taking pictures of it yet). Enjoy the review and I’ll update with photos when I’ve taken them (and will most likely delete this paragraph). My never ending quest for the perfect pen has led me mainly to pens of Asian decent, as I believe I’ve mentioned before. And I’ve found some pretty good ones on offer, but with problems that prevent me from declaring them perfect. Mostly because they don’t allow cartridges and since I do most of my heavy writing while traveling and carrying an ink bottle is both inconvenient and not allowed (on planes) I was forced to look elsewhere. Recently I’ve set my sights on Pilot, trying a few different models, the FP-50R (reviewed here), the Knight (not yet reviewed), and most recently, the Pilot Prera. 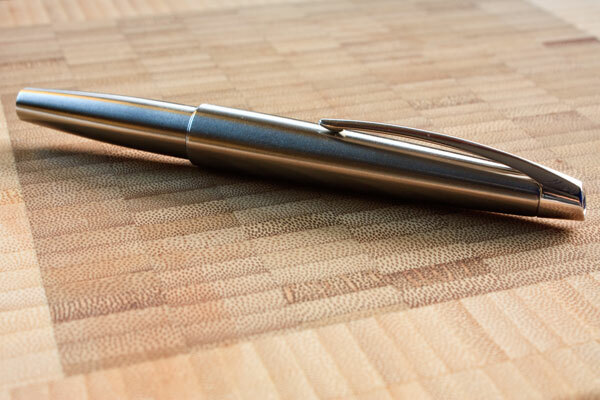 The Prera is a relatively inexpensive pen not yet widely available in the US (I got mine from JPens.com for $36). It is available in a variety of colors and has a clean, functional compact design. It comes equipped with a fine nib, which translates as extra fine in comparison to most Western nibs. It writes smooth fine line unlike the similar nib on the FP-50R. It takes proprietary Pilot cartridges (see earlier rant), and a Pilot converter. I originally filled it with Mont Blanc’s English Racing Green (still one of my favorite colors) and now have it filled with a blue Pilot cartridge (which I do not care for at all, way too washed out). The pen body is made from plastic so it’s a pretty light weight pen. With the cap unposted it’s a hair bit on the short side for my taste, so I generally post when I’m using it. Over all I’m pretty happy with this pen, it works perfectly with a Molsekine as there is no bleed through on the thin paper.